For years people who find themselves over their heads in debt have filed for bankruptcy. So many, in fact, that approximately 1 out of every 191 people declared bankruptcy in 2002. It’s a big legal sounding word, but what does it mean? Chapter 7 is available to individuals. 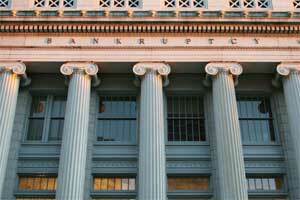 Also known as a “straight bankruptcy” or “liquidation,” discharges most of the filer’s debts. Meaning that the creditor, to whom the money is owed, will not get paid. Chapter 13 is characterized by a minimal repayment of debts due on a schedule that has been arranged by the court. Debts are not paid according to agreement made between the debtor and the creditor, though the creditor receives some portion of the money owed him. Many times this structured declaration allows the debtor to retain assets such as homes and cars. Chapter 12 was set up for the family farmer who depends on his land, which is sometimes unreliable, for income. It functions like chapter 13 but is reserved for non-commercial farmers only. Chapter 11 is primarily used by large corporations, which are insolvent, who wish to pay off their debts through a repayment plan. There has been a steady upward trend in the number of actual filings, from approximately 300,000 in 1980 to a whopping 1.7 million non-commercial bankruptcies in 2005. Statistics show that around 31.9% are couples; which means that approximately 2,242,300 individuals walked away from their debt last year in one form or another. Change to this system began in October of 2005 that will require those who wish to file for bankruptcy to prove their financial hardship before allowing them to do so. The hope is that this will cut down on those who are using the system as a money management strategy. When you took Independent Advantage, we talked about debt being a relationship you enter into voluntarily. You and the creditor both agree to abide by the terms of the agreement. They lend you money and you pay it back, with interest if it’s not paid in full each month. You don’t have to spend their money. We also discussed the use of unsecured credit, the most popular being credit cards. Carrying large balances on too many credit cards can stretch your future income to the limit. It can take just one event such as loss of employment, an accident or a major illness, to make repayment impossible. You learned how to carry debt in a responsible manner. When using your credit cards you need a plan for repayment. Don’t charge another purchase until you’ve paid off the previous one. You may also remember that we discussed the importance of preparing for such emergencies. A good rule of thumb is that you have 3 months worth of income in reserve (savings)…just in case. Lastly, please remember that bankruptcy hurts everyone. Our economy, individual businesses, and consumers like you and me.